Are you ready if your A/C breaks down this summer? 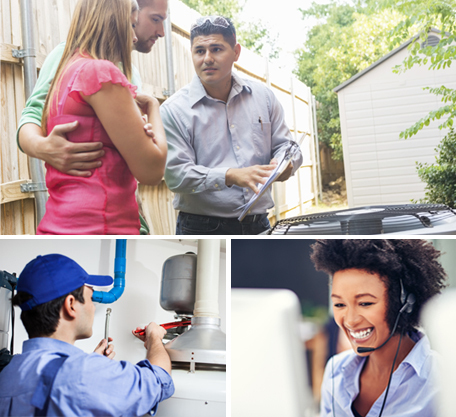 Protect yourself from costly repairs with a home service plan from TotalProtect®. When a covered system breaks down, call us any time or place a claim online. We’ll find a local, pre-screened technician to service your covered system. 1See terms, conditions and limitations in your Service Plan Agreement that you can review once we receive your enrollment request and send you your materials. Covered items must be in good working order, with no apparent visual or operational malfunctions, on your Agreement effective date. Service call fee due at time of service. This fee is separate from the monthly plan premium. Non-covered and incidental charges may apply to certain repairs or replacements. If you cancel after the effective date you may be responsible for any costs associated with claims processed during the term of your Agreement prior to cancellation. Benefits may vary by state. Not available in all states; subject to sales tax where applicable. 2 Reimburses you up to $1,200 if (a) your only cooling or heating system is non-operational for 24 hours or more from the time of the first service visit should there be a delay in acquiring repair parts, or (b) a sudden break in a water pipe results in flooding and the removal of water from the residence by a water removal company is delayed by 24 hours. Only 1 claim, per customer per 12-month period. Additional terms and conditions apply, which will be included in your plan materials you receive after enrollment. Country Home Services, Inc. are not affiliated in any way with TECO Peoples Gas, its affiliates, or subsidiaries. ©2019, Cross Country Home Services, Inc. All Rights Reserved.